THERE’S quite the trade for German Nazi war helmets as artist Manou Marzban knows all too well – and this was long before US President Donald Trump retweeted those now infamous videos. “I could clearly see from the sort of name tags fellow bidders had during the online auction (for German war helmets) that they were not exactly liberal type people – they were from the other side of the fence,” the Iranian-origin artist told www.asianculturevulture.com with a smile, when he was in London. “They are the kind of people who put a helmet in their homes and worship it, and that just made me even more determined to get them and take it away from someone else and paint them,” explained Marzban who signs his work, Manou. 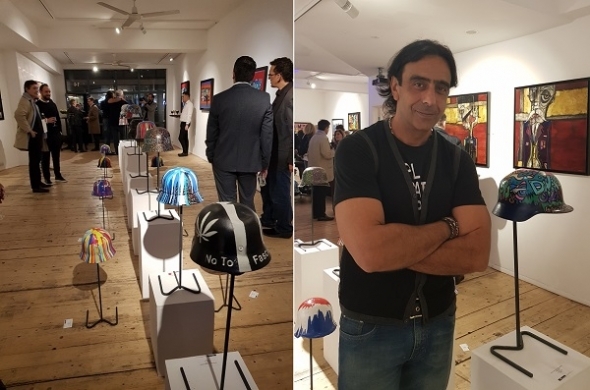 This work and his other art was all on display between November 16-17 at Gallery Different in W1, close to Tottenham Court Road in central London. The gallery was very busy and there was much international media attention at his first London showing. A full-time artist since about 2013, he has lived in the South of France for a while with his wife and two teenage sons. Marzban has painted 18 of these authentic German war helmets – and they are all brightly coloured and proclaim a message of Diversity, liberal ideals and are stridently and vocally, anti-fascist. There are 18 because to Marzban it represents every year Hitler had power and influence from 1927 till his death. Marzban cites Hitler’s release from prison and the lifting of a gagging order as the time his ideology began to exert influence. “I didn’t want to make them from plastic or replicas. Some German friends came to the London show and couldn’t quite believe they are real. I showed them, the helmets are very heavy. I didn’t want to take away from the historical context of these helmets, they are rooted in the authentic. “It’s rather ironic. They were made to save lives and were brilliantly designed and were more expensive to make (than British or US helmets) but they have become vile symbols of fear and death,” explained Marzban, who as the son of a senior Iranian diplomat, spent much of his formative years in the UK at boarding school, before going to the US for undergraduate studies. What Marzban does to the helmets completely undermines their Nazi symbolism – the bright colours, the anti-fascist slogans and even brightly coloured sperm tails (on one) represent something else completely. “My German friends who came to the exhibition in London were perplexed and told me that no German artist would ever do this. “I told them, ‘Well, look, I am not German and I can do whatever I want’. “Secondly, if I get under the skin of such people who think I have insulted their ideology, well, great! I have succeeded. I was quite amused by that response,” he laughed. In a sense the ‘Diversity not Fascism’ series was a reaction to what was going on around him in 2015. A History and Communications graduate from the US, he was appalled by the rise of the populist Right which was distinctly anti-diversity, anti-immigration and in some guises, openly and unapologetically racist. At his private school in England, there was only one other non-white pupil and he was a boarder and there was no escape. “It was very traditional, very stern. I was the only foreign student. With my complexion I was subjected to a lot of racism, bullying and getting whacked about,” he revealed. Though he later developed into a tall, broad-shouldered and sturdy fellow with an ability to play sport to a decent level, in his pre-puberty days, he was slight and relatively small and English (private) schools in the 1970s were horrible places if you stood out and were in any way different – racism abounded and went largely unchecked at a pupil-to-pupil level. The ‘Ping Pop Series’ are regular table tennis tables which he transformed into artworks, again covering them with positive and liberal messages. He used an old one in his garage as a work station – before a friend noticed something. There were two major turning points in his life that took him down this particular road – in addition to his humanitarianism and commitment to environmental causes. His first show in Paris in 2013 proved to be a big hit – Farah Diba, the elderly widow of the last Shah of Iran attended and bought his work. In fact, he sold all 32 pieces on display. Secondly, since his father – who had been ambassador to both Sweden and Thailand and had enjoyed a long diplomatic career before retiring and being exiled following the Revolution – died in 2005, his art had taken on a different dimension. From there, he and two Egyptian friends created BiblioTech in London – an early European forerunner of Hotmail, which branched out into many areas like education over the Internet. He left before the company was sold and had started working for Microsoft’s educational digital division. “All this time, I had been doodling and drawing and 2005 and the death of my father was a signal, a door that had been closed, opened. “I remember feeling a little anxious about devoting more time to my art and less to Microsoft and a friend from there said: ‘Remember that presentation you did in 2008 when everyone stood up and clapped…no one remembers it now. His next project is to find a condemned (council) building, paint it black and then cover it with multi-coloured sperm tails to represent Diversity.